Croatia is one of your favourite destinations and it isn’t there for no reason! Made up of several hundred islands, the country offers an incredible diversity of landscapes. The contrast between the crystal-clear water of the sea and the green vegetation on land will not leave you second-guessing. The best way to visit this destination is, without doubt, by sea! Follow the guide, we will take you on a discovery of the (almost) secret islands and coves of the Adriatic Sea. The entire Croatian cost benefits from a very pleasant Mediterranean climate with lots of sunny days, dry and hot summers, mild and humid winters, enough to fully enjoy your cruising adventures in Croatia. The best season to sail in Croatia is from spring until early autumn with temperatures ranging from 20 to 30 degrees, with water temperatures reaching 25 degrees in summer. You will love the beauty of its shores and its rather calm sailing conditions. The presence of many islands limits the offshore swell and makes the sea manageable. Easy to navigate, the Adriatic coasts will delight the most experienced in search of beautiful outings and will not trap the novices. It is one of Croatia’s most popular recreational areas. The Kornati Islands offer a natural skyline as far as the eye can see. You can start your cruise by visiting Zadar and then head to the Kornati National Park for peaceful and magical sailing. We hope you will have the chance to see the dolphins there. Don’t forget to check the anchorages before entering the Park, they are regulated there. A small town close to the airport, it possesses a rich cultural heritage derived from the Greek, Roman and Venetian influence. Trogir has many palaces, churches, and even an island fortress. Croatian marinas are renowned for their modern and very comfortable facilities. During the week, there is usually space in the marinas, as many rental boats have left the port. On the other hand, on weekends, it is preferable to book your place at the port on the Navily application, here is a great port nearby: Marina Frapa. Otherwise, very close to the city, you will find an anchorage with good protection even if westerly winds and a slight swell can cause some sway. Here, people do not come to celebrate but to recharge their batteries alongside luxurious nature and a variety of wildlife. Mljet National Park, in the northwest of the island, is particularly well known for its diversity and two lakes. A real little gem! At Korčula, you will find everything that contributes to Croatia’s beauty: pretty little villages by the sea, incredible hiking trails and small natural beaches for swimming. It’s one of the greenest islands in Croatia! It is mountainous with forests and vineyards. Korčula has many ports and coves with turquoise waters: Orlandusa, Pavja luka… Something to make you dream a little! Drop anchor at “Uvala Luka”, very well protected against wind and swell, to visit the old town and leave your annex at the port. You can’t plan a trip to Croatia without a stopover in Dubrovnik. As you approach the coast, the old town and its ramparts suddenly appear, suggesting pretty walks. A whole day of rushing down its medieval alleys won’t be too much! Its wall is one of the best-preserved fortifications of the Middle Ages and is classified as a UNESCO Cultural Heritage Site. Well sheltered in Dubrovnik Bay, Lokrum is a very interesting island to visit. There, no accommodation, no hotel or camping, is a preserved paradise! The name Lokrum comes from the Latin word “acrumen” which means “sour fruit”. Lemons and oranges still grow there today. The island is only a few hundred meters from the Dalmatian coast, very easy to access with your rental boat from Dubrovnik. Your visit to the old town will surely take you to the Saint-Jacques cathedral, built entirely of stone. 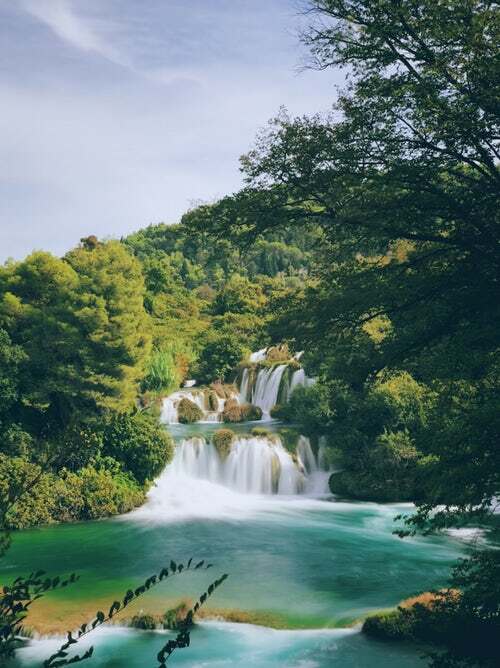 You can also venture a little further inland to discover the Krka National Park. It is renowned for its luxuriant vegetation and superb waterfalls that descend seventeen levels with a 45-metre drop. An excursion 15km from Sibenik that is well worth a visit!